Prosecutors General from Europe and Mediterranean countries (Algeria, Egypt, Israel, Jordan, Lebanon, Morocco, the Palestinian Authority, and Tunisia) agreed on the Guiding Principles of the EuroMed Forum of Prosecutors General setting up the main objectives and principles of collaboration, communication and continuation of the Forum with the objective of improving international judicial cooperation. The agreement of the Guiding Principles of cross-regional collaboration took place this week under the impetus of EuroMed Justice, the program financed by the European Commission for judicial cooperation between the countries of Europe and the Mediterranean. 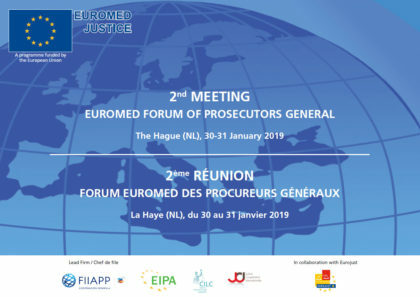 This second Forum, promoted by and held at Eurojust’s premises, and following the cornerstone laid by the Spanish Prosecutor’s Office last year in Madrid, was well received and welcomed by the Prosecutors General from the participating countries. The Forum allowed the Prosecutors General to share experience and best practice on issues related to cyberspace and judicial cooperation in criminal matters; personal data protection and cooperation with third countries; joint investigation teams; and countering terrorism and organized crime, particularly smuggling of illegal migrants and trafficking in human beings and drugs in the Euro-Mediterranean region.